I hope you all enjoyed a safe, and great holiday weekend. I know I sure did. I got lots of family time in, friend time, and relaxation time. Plus the influx of drinks consumed this weekend weren’t bad either. Sun setting the weekend in style, I am brining you a very interesting cigar, Drew Estate’s Liga Privada Unicos Series “A”. 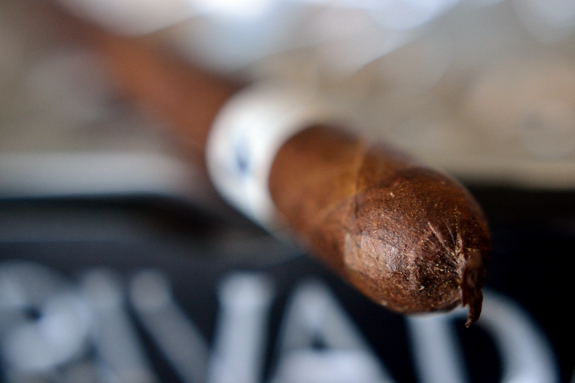 The Good Stuff: I was one of the very many people intrigued as rumors began to fly about a possible Liga Privada in “A” format. 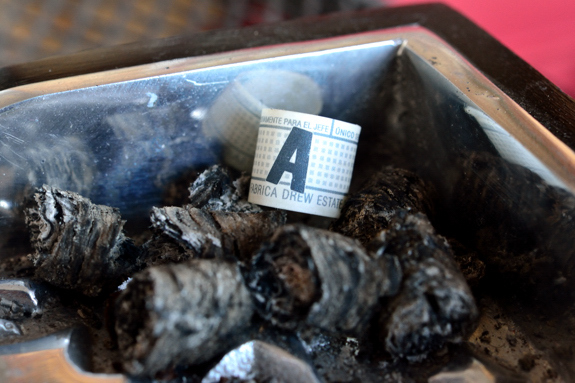 Not that I am an “A” kinda guy, but that’s a huge departure from anything currently in the Liga Privada line. Not to mention that I am an open Liga Privada Fan Boy. That won’t make this review biased though, trust me. 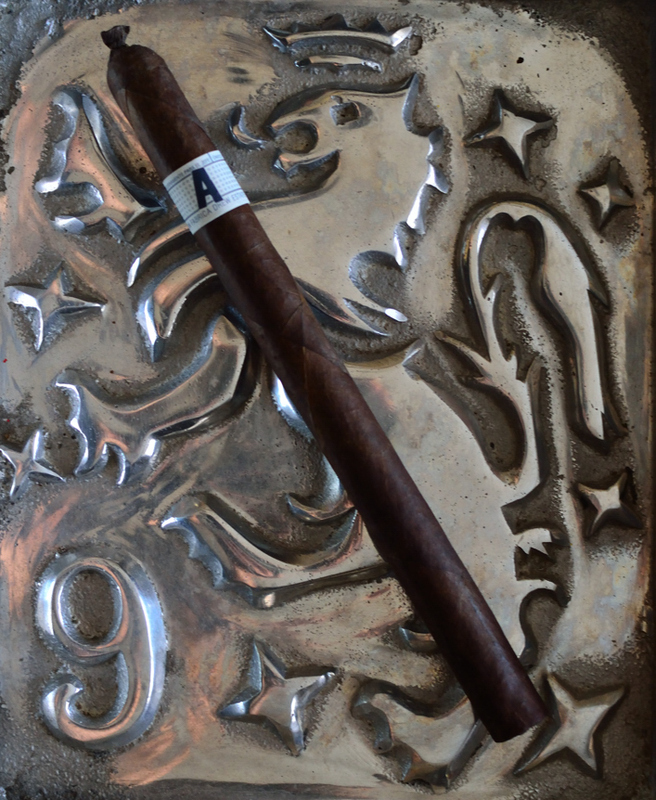 After about a years worth of rumors Jonathan Drew confirmed that they would in fact be making an “A” sized Liga Privada, and began to hype it up with some Jonathan Drew style tweets and Facebook posts. I just had to put the "A" next to a Dirty Rat for size comparison. And for laughs. As time went on, we discovered this wasn’t a real release, but instead a special type of product. 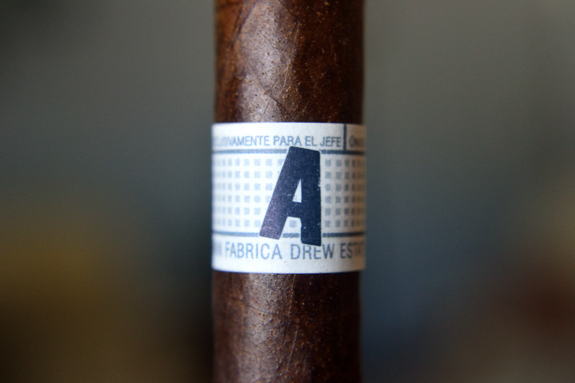 What I mean by that is, Drew Estate actually created the Liga Privada “A” as a special promotional product. The “A” is actually a tweaked T-52 blend. More than likely they needed to refine the blend and mellow it out a bit to fit the format. I’m glad too, I don’t think I could handle a straight up 9 inch T-52. These cigars will not be available to purchase, instead, they will be given out at certain Liga Privada events due in part to the limited amount of T52 leaf as well as Drew Estate wanting something special as a thanks to it’s customers. Plus, in my opinion, I don’t think the format is easy to sell. I was actually on Smoke Inn’s radio show “Kiss my Ash Radio” this passed weekend with Erik Espinosa from EO Brands and he made mention that he was actually present some time ago when he and Jonathan Drew opened the first box of Liga Privada Unicos “A”. That being said, I think it’s safe to say these will be readily available at Liga Privada Events. I don’t smoke “A” sized cigars often at all. But there is a reason for it. 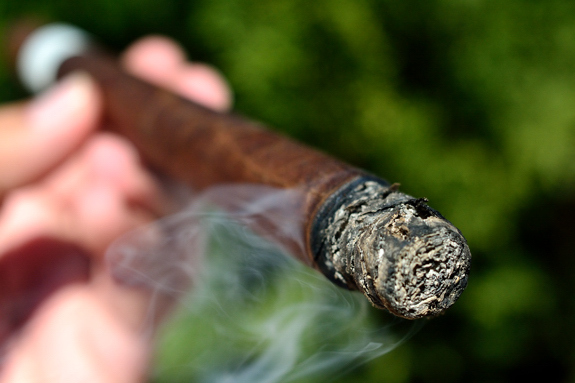 “A” sized cigars were created to honor celebrations. This is a special treat sort of size, to be smoked to celebrate special occasions. With good reason too, they are normally 9” long and usually take around 3 hours to smoke. That being said, lets get started! Size: 9 ¼” x 47 – Wrapper: Connecticut Stalk Cut Habano – Binder: Brazilian Mata Fina – Filler: Nicaraguan/Honduran/Dominican – keep in mind this is just an assumption, knowing that it’s a tweaked T-52 blend. Prelight: This is a GIGANTIC cigar. It almost feels too heavy to hold and wants to fall from my hand when I hold it near the head of the cigar. That goes with all “A” sized cigars I guess. They aren’t the most practical cigar, but they aren’t trying to be. Once you get passed the size of this cigar you are greeted with the beautiful T52 style wrapper that we have all grown to love. The wrapper is incredibly oily with medium to dark browns and oranges mixed in. The construction is perfect with only a very few larger veins. Usually veins of that size would run the entire body of a robusto sized cigar. 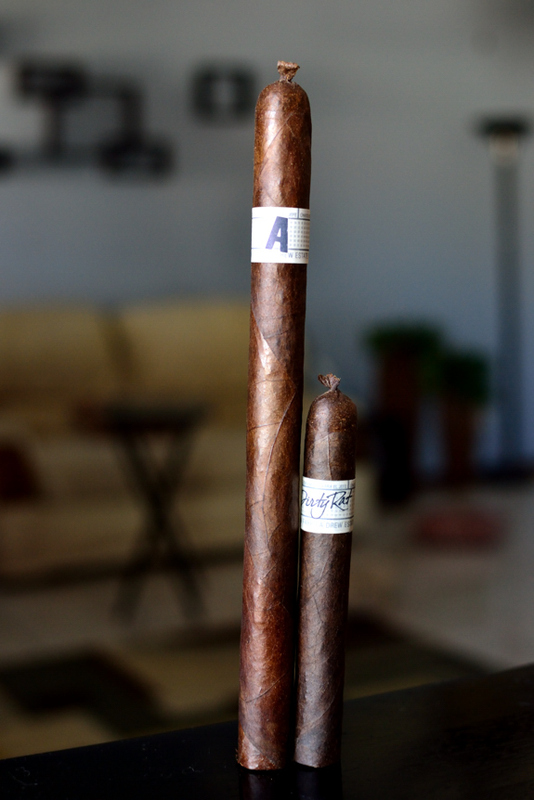 I just though it was funny that the Liga Privada Unicos “A” had 2 longer veins stacked one after another, and they still only ran about half the body of the cigar. Anyways, the wrapper and the entire cigar in general is very solid and durable. There aren’t any soft spots on the entire cigar. The cap is very similar to the pig tailed, rounded cap that the Dirty Rat carries, only twice the size. And the band is identical to the Unicos Series bands that all the Liga Privada carries, blue and gold with a gigantic “A” on them. 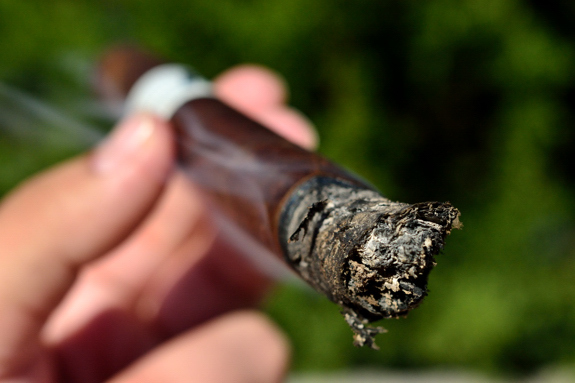 The body of the cigar gives off a nice, strong cedar and sweet tobacco aroma while the foot of the cigar gives off nothing more than a very subtle spice. The cap clipped extremely easy and clean using my Liga Privada Double Bladed cutter. The cold draw was interesting, instead of greeting me with a nice pepper I was expecting, The “A” let loose this crazy strong cedar and sweetness which got me interested in just how “tweaked” this blend really is. First Smoke: Right away the Liga Privada Unicos “A” kicked out the flavors I expect from the T-52. Cedar, spice, sweet tobacco, and cocoa. One thing was still missing, the pepper. In all honesty I’m glad too, a 9 inch pepper-bomb just doesn’t seem like it would sit too well with me. Despite the distance in which the smoke must travel, the draw was perfect and plentiful. It only took me my normal 2 puffs to get a mouthful of thick, white smoke. The burnline is a bit wavy and thick, but nothing too concerning, white the stationary smoke, as with most Liga Privada blends, is crazy. This cigar is spewing out tons and tons of thick, cedar scented smoke as it sits in my ashtray. The ash left behind is somewhat flaky, and really dark grey with spots of lighter grey. It only held on for about two thirds of an inch before giving way. Halfway There: The sweetness has really started to pick up into the second third of this Liga Privada Unicos “A”. By this point, I’d be finishing a robusto format cigar, but this cigar is still keeping my attention by adding a ton of spice and the sweetness I mentioned to the already sweet mashup of cocoa, and cedar. The burnline has completely corrected itself and is burning dead even now. The retrohale is BADASS coating with an absolute blast of cedar each time I do it. I am feeling a very slight nicotine kick after the second third, but no where near what I was expecting form a Liga Privada blend. Finish: Switching it up again, I started to get this nice, subtle floral flavor during the last third of Drew Estate’s Liga Privada Unicos “A”. The sweetness has mellowed out quite a bit, and I am left with a really smooth cedar, cocoa, coffee and floral mixture. Surprisingly for the size I’m really not picking up much more than a really slight nicotine kick. The burnline has been perfect since the second third, and I haven’t had to relight, or even touch up this cigar once. All in all it took a few minutes shy of 3 hours to take down this beast of a cigar. It’s crazy how the final picture looks similar to the length of a “First Smoke” robusto picture. This thing is huge. Overview: I have a short attention span. Very. I blame the internet and technology for that. That being said, I never really got bored while smoking this Liga Privada Unicos “A”. It had just enough change ups to keep my attention, but at the same time was smooth and seamless enough not to overpower me with each jump. I think finding balance in a cigar as big as this, and keeping the cigar’s complexity has the be an incredibly difficult task for the blender, and Drew Estate did a hell of a job with it. 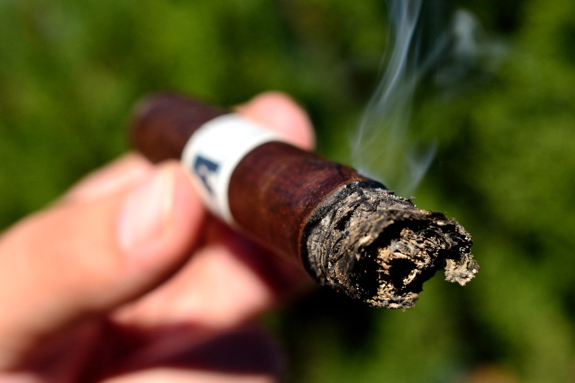 The cigar wasn’t as powerful as the other blends in the Liga Privada Line, with good reason. I don’t think I could handle a 3 hour T-52 It would leave my crying on the floor. Although this isn’t a cigar I’d smoke often, I really enjoyed it a lot. And in terms of the format, it’s not made to be consumed often. As stated, it’s a celebratory cigar. And I really think it’s a great addition to my humidor when I want something special and have a few hours to burn, pun intended. Pairing: I said it many times, and will say it again, Winter is the season for beer. With all the awesome porters, stouts, and Christmas ales it’s a wonder why I’m not trashed from morning to dawn. 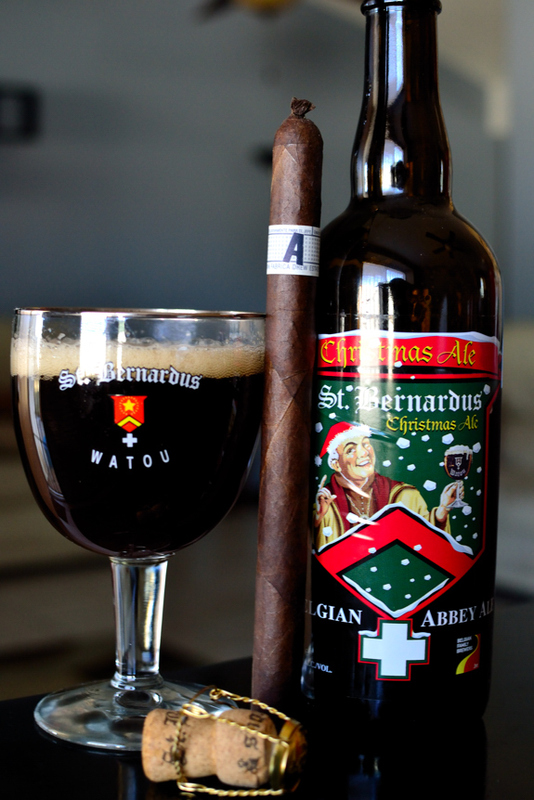 St. Bernardus isn’t a stranger to this blog. In fact, it’s one of my favorite breweries out there. This Christmas season Abbey Ale hits the mark on all accounts. It’s strong (10% ABV), sweet, flavorful, and well balanced with fruity, malty flavors and just a hit of spice. Needless to say it went perfectly with the Liga Privada Unicos “A”. At about $13 a bottle, it’s not something you can drink everyday, but when you find it, pick it up. It pairs great with any full bodied, full flavored cigar. ← Previous Story Casa Magna Domus Magnus Live Review! Great review man, everything about this one sounds great, apart from the length and time commitment (and being able to fit it in a humidor). Is that a new ashtray, or have I not been paying enough attention? I am smoking one now it’s my 3rd one in the last couple of years. Your right, perhaps one or two a year is sufficient. I smoked a t52 at 11am earlier today and the smaller was much stronger. Good thing. That is one impressive stogie. I love the U.S. Thankgiving. All day football on Thursday with cigars and beer after the work day winds down. I was talking with a buddy of mine and we were saying we should take the day off next year. I’ve got to find out from Daniel T where I can get a couple of the Liga Privada’s up in the Great White North. Great review and pics Tony!!! two veins running down the sides…. bwahahaha… Great review. I am such a small cigar guy, that it takes alof effort to put that much time into a cigar of this size. 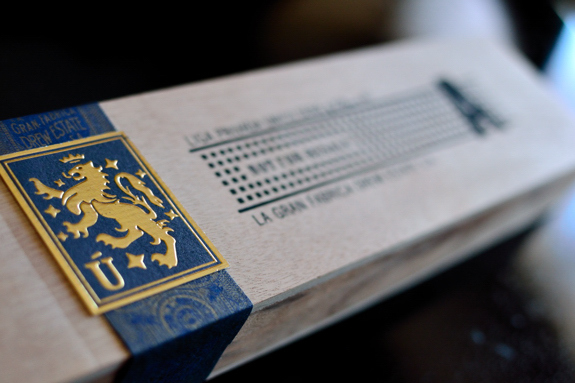 I prefer corona, CG, and robustos… I am however a sucker for the liga products… I hopefully can snag one of these when Mr. JD comes to town. Nice review and good pairing. Keep up the mediocre work…. errr so so…. errr decent…. errr good… Great stuff T! I have to remove this comment so that it will not offend some of our younger readers. Kidding. I too never really smoke bigger cigars. I stay away from churchills and “A”s for sure. But this cigar was good for the size. I was really impressed, although it’s not something I’d regularly smoke. Ahoy Cman! thanks for the read. 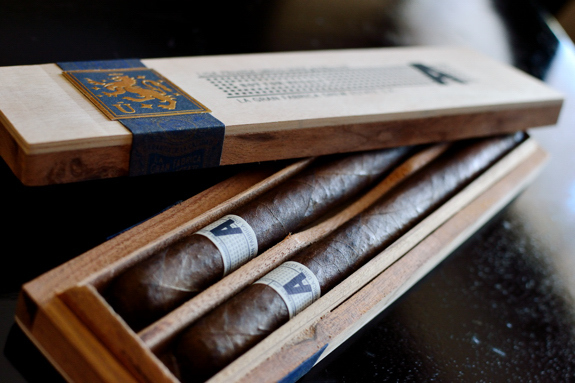 Jonathan Drew actually sent these to me, but you can find them at any Liga Privada event. They won’t be available to purchase online, nor at retailers. You will have to attend an event for a chance to get your hands on it. The beer WAS awesome! I really like anything from this brewery, and I am a sucker for winter seasonals. Again, thanks for the read man, take care!